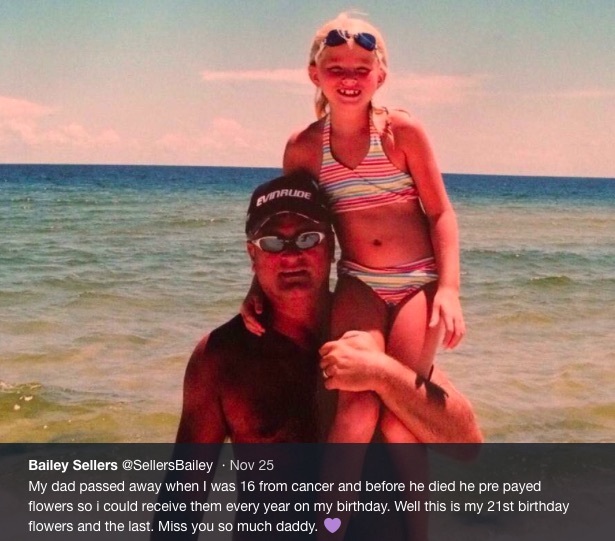 A dad sent the 21st birthday message for his daughter. The message is heartbreaking because, the dad had pre-planned the delivery of flowers and birthday cards for 5 years after his death. This is my last love letter to you until we meet again. I do not want you to shed another tear for me my baby girl for I am in a better place. You are and will always be the most precious jewel I was given. It is your 21st birthday and I want you to always respect your momma and stay true to yourself. Be happy and live life to the fullest. I will still be with you through every milestone, just look around and there I will be. I love you Boo Boo and Happy Birthday !!! Daddy. I wish every little girls have daddies like that of Bailey.